1. Update lampshades with new ones in more contemporary shapes or simply fresh white shades. 2. Paint is the classic makeover potion. 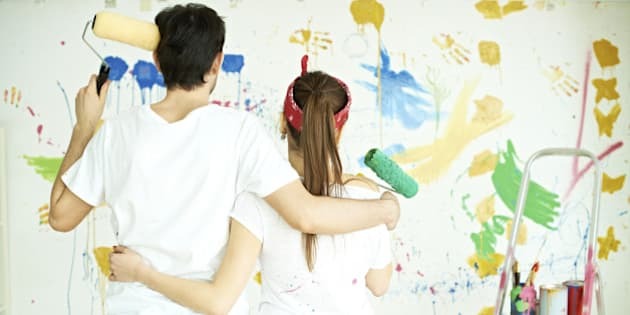 Instead of repainting a whole room, just paint one wall in a focal colour or paint a contrasting rectangle over a sofa to use as a “gallery” space. You can also paint the insides of bookshelves in an unexpected colour or paint your ceiling a lighter version of the wall colour. Update your kitchen with paint or any other space in your home. 3. Update your window dressings. IKEA and other home stores have reams of readymade draperies you can hem to the right size (or leave to puddle on the floor), or you can make your own from sheets or lengths of designer outlet fabric. Hang from an attractive new curtain rod, also available in stock sizes. 4. Pull a room together by choosing two contrast colours – black and white, say, or white and one bright colour – and use them as a repeating theme throughout, such as a row of yellow and white pillows on a sofa, or robin’s egg blue walls and all-white furnishings. 5. A simple but effective tip: Edit your accessories. Too much of a good thing is too much. Try taking all your home decor accessories and putting them in a box, then putting them back one by one where they’ll have the most impact. 6. Take down all your paintings and other art and move them around to different walls or different rooms. It’ll be like seeing them for the first time. 7. A classic display scheme ever since Victorian times: Create a gallery wall of family photos and other small pictures in matching (or contrasting) frames, arranged in a collage on a large wall such as a stairwell or hallway. (For best results, first create a plan by arranging them on the floor till you find the right composition and “balance.”) The art of arrangement is always stylish. 8. Inexpensive frame moldings from the box store can transform a plain wall or hallway into an instant paneled look. Paint the moldings in a contrasting shade or white. 9. Replace overhead lighting with thrift-store (or box store) chandeliers. (Note: it’s recommended to hire a professional electrician to install them.) A dated-looking chandelier can be painted white. You can also add extra crystal drops, available at lighting stores. 10. Peruse Craigslist, eBay or freecycle.org regularly for finds. It’s amazing what shows up at a bargain or even free – but like any good flea market shopper, be sure to check regularly, as good things go fast. 11. Carpet stores often have remnants of high-end carpet at rock-bottom prices that make a great area rug. The store may bind the edges for you, or you can do it yourself with carpet binding tape and some tidy hand-sewing. 12. Some paint stores sell mixed paint for much less than custom-mixed paint because the colour was off or it was returned to the store. Great if you’re willing to experiment on the colour. 13. Re-tile kitchen backsplashes. Most backsplashes require only a few square feet of tile, so you can treat yourself to a fancy style or use plain porcelain tile for most of the surface. Then intersperse a few hand-painted or high-end tiles as accents. 14. Small details make all the difference: Beautiful coasters, interesting desk frames, a small but exquisite crystal vase filled with fresh flowers. 15. Buy a half-dozen four-inch terra cotta pots and paint in a trio of coordinating colours. Plant with herbs and line the pots up on a kitchen windowsill. 16. Big box stores have come a long way in terms of cheap and chic bathroom accessories and stylish storage options. For a fraction of what you’d pay in a high-end bath boutique, you can often get pretty designs in wood or china, or sleek modern accents. 17. A trick made famous by Woody Allen in Annie Hall: Change the light bulb in your bedroom lamp with a pink one for a rosy, romantic glow. Or opt for a pink lampshade, which can produce something of the same effect. 18. Replace the drawer and cabinet pulls in your kitchen, bath, bedroom, or on a furniture piece. Inexpensive stylish options can be found at Lee Valley, Summerhill Hardware, IKEA or other big box stores, or you can scour a thrift shop or antique store for vintage ones. 19. Replace your bathroom shower curtain and curtain hooks, for an instant freshener for even the most dingy bathroom. Create a sparkling bathroom makeover. 20. You can now buy readymade slipcovers that with a few judicious tucks, fit much better than the wrinkly versions of yore. Or, for a little more investment, have loose-fitting slipcovers made. 21. Replacing an ugly old faucet with a new one is a relatively simple DIY project. Many big box store styles are designed for home installers and include all the fittings and instructions in the box. 22. Purchase an inexpensive but attractive frame, or rescue an old one from an antique store or your parents’ attic. Paint flat white and attach small rings to the upper corners. Place hooks on the wall to correspond and hang. Hang a couple of vintage plates or smaller framed pictures artfully inside, or leave the framed space as-is, for an artful and simple focal point. 23. Maximize light in a darker room by hanging a framed mirror directly opposite the window. 24. Take a walk in the park, woods or beach and pick up interesting (and free) seasonal accents for your home. A tray filled with pinecones, a tall vase of dried pampas grass stalks, or a bowl of colourful pebbles, beach glass or shells all make eye-catching home decor accessories. 25. Spruce up your entrance by painting your front door a cheerful colour. Pair it with a new lighting fixture, mailbox and house numbers - all available at the box store.